If you are planning a build or renovation for this year it is worth considering the use of decorative mouldings. Parapet mouldings are almost standard in most builds but you can create so much more. Impressive,grand entrances can be fashioned with archways and columns, keystones and even custom made mouldings of house numbers or decorative motifs. A balcony atop a portico can be further enhanced with an arched window with decorative rivets and a keystone. A plain window can be transformed with architraves, headers, sills and a decorative keystone. Once you’ve got your basic structural ideas in place and the addition of decorative columns, arches and window architraves consider the extra flourishes you can attain with keystone mouldings, quoining mouldings, corbel mouldings, flatbands or rivet mouldings. Columns make the grand statement, from ancient roman times to the modern day, besides a stately portico entrance they can be used to stunning effect for a poolside gazebo. Talk to Steve De Gregorio of The Finishing Touch for advice on the best mouldings for your design and ask him about custom designed mouldings to your specs, if you have some ideas in mind. The Finishing Touch supplied decorative mouldings, contributing to the stunning finish of a two storey, sixty square French Provincial house at 167 Dolford Rd, Kew, designed by Architect Phillip Mannerheim. 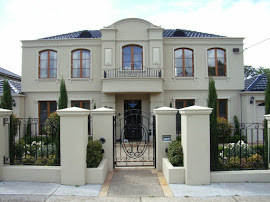 This highly respected Architect specialises in high end residential homes, including the French Provincial style. Another French Provincial house of two storeys has been decorated with the use of the lightweight mouldings supplied by the Finishing Touch. This large home of seventy squares at 26 Nott Street, Balwyn has been enhanced with large, custom made eave mouldings, measuring 300mm x 200mm. Windows have been beautifully finished with Window architraves and Window sills, whilst Parapet moulds, Quoinings and Stringers further embellish the home. Column Capitals complete the splendour of columns already installed. Building continues in the new year with some interesting projects for the Finishing Touch. The first project of the year is a sixty square, single level, modern home in Tiffany Grove, Templestowe which had decorative eave mouldings installed already by the Finishing Touch. Now the home will be supplied with decorative mouldings for all the windows and doors. The Finishing Touch are currently manufacturing the lightweight mouldings, with site delivery and installation scheduled in 2 weeks. They will be supplying architraves for all the windows and doors, blocks below the windows as well as headers for the windows to create an impressive finish on the home. An impressive French Provincial, sixty square home of two storeys is being built at 18 Alexander Avenue, Canterbury. With a verandah and porch as well as a balcony over the entrance, this house lends itself to a decorative flourish. Decorative corbels above the verandah and porch area along with chimney mouldings, parapet mouldings and eave mouldings will create a distinctive look. However, the entrance will be simply stunning with two columns, a decorative keystone above the entrance door and a balcony above, decorated with metre long corbels. The balcony is further enhanced with rivets on the door architraves. Windows are an important feature on a home and on this house will be decorated with window headers and window architraves with blocks at the base of the architraves. A single storey modern home of twenty five squares at 18 Fairlie Avenue, Macleod will have a handsome finish with decorative mouldings for the window architraves, garage architraves and window sills as well as parapet mouldings and stringer mouldings. As building activity is about to start again for the new year of 2015 it is timely to reflect on some of the sub-standard mouldings the Finishing Touch were called in to replace during 2014. Even a brand new home of over one hundred squares in a sought after suburb in Melbourne was not spared. Some of the mouldings were not completed, the joins were all visible with the mouldings not meeting and the corners were broken with poor, patchy repairs. When architectural mouldings are installed on a build the aim is to decorate and add pizazz to the house. Builders and Owner/Builders need a supplier of decorative mouldings they can trust to achieve this. The Finishing Touch have a sound reputation for professionalism, quality and efficient installation of architectural, decorative mouldings. The light weight mouldings supplied by The Finishing Touch are made from computer cut high grade EPS polystyrene, which are then triple coated with a multi-part compound and reinforced with a triple coating of sand for maximum strength and durability, delivering a product that will not crack, shrink, expand or bend. Finishing Touch mouldings are installed by certified installers which carries a 7 year warranty on all fixing. The decorative mouldings are finished in primer at the completion of the manufacturing process, so they are ready to paint within 24 hours after installation. The installation team uses a render patch system which virtually eliminates any sign of joins. The efficiency with which the mouldings can be manufactured and installed, due in part to the light weight material, assists Builders deliver the completed overall build or renovation on time. Gaining in popularity due to the efficiencies and ease of installation, Finishing Touch light weight mouldings add value, beauty and a quality finish to a house, lasting for many years.